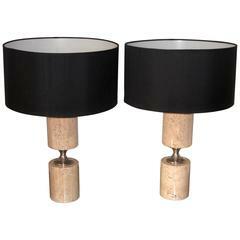 Set of table lights, in travertine, for Maison Barbier, France, 1960s. 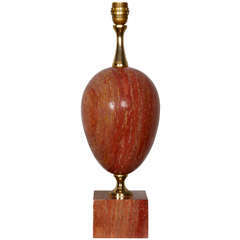 Matching pair of elegant lights by Maison Barbier in rare red travertine. Both the base, and the shade show interest shaped and well designed lines. Red/pink tones Gilt details Minor gilt misses on one of the lamps. European sockets and wiring. 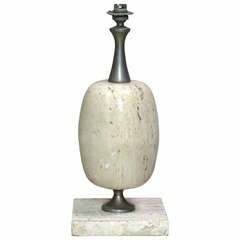 Steel and travertine table lamp by Maison Barbier. 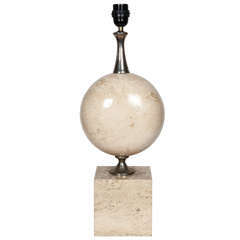 Travertine table lamp by Maison Barbier. 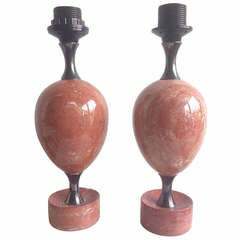 A pair of cylindrical form taupe tone natural stone table lamps. 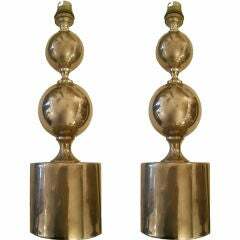 The center is a hourglass shaped nickel. New silk shades in black have been added. All wiring is new for the US. 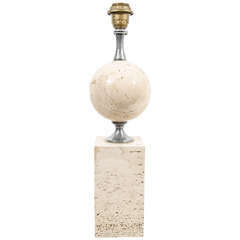 1970s travertine lamp by Maison Barbier. 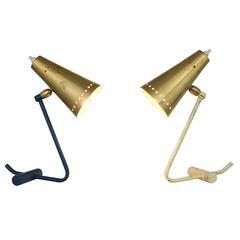 Pair of two spheres Maison Barbier table lamps.